Based on the successful blog of the same name, Stuff Dutch People Like is a very funny look at ‘all things orange’. 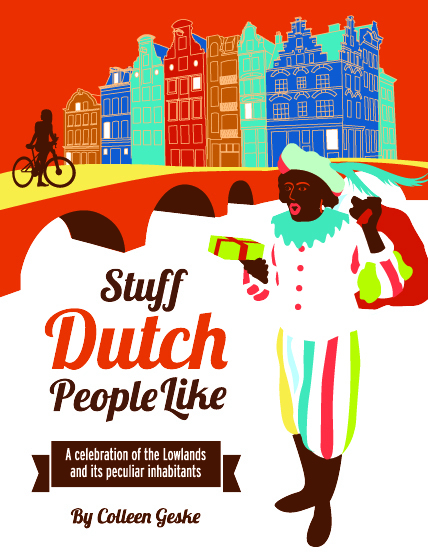 Without the slightly sour taste of some books which poke fun at the Dutch, SDPL explores the world of white leggings, the way Dutch men (including the king) pick their noses in public and the strange world of fries and liquorice. Author Colleen Geske, a Canadian national, has lived in Europe since 2004. A communications and social media consultant by trade, Geske has a sharp eye for detail, a witty turn of phrase and an apparent warm affection for the country she has made her home. The blog has been a runaway success, particularly with the native Dutch, and some of their more bizarre and bemused comments are included in the book. Liberally illustrated, Stuff Dutch People Like is the ultimate book for smallest room in your Dutch house – alongside the birthday calendar (page 138), the sink with cold water (page 147) and underneath those impossibly steep stairs (page 128).